The rains had finally given into the parched earth. Unabashed, purposefully, they fell from the heavens. A sweet scent from the wet mud filled the air, as the raindrops arranged themselves in a sonata. The neighbourhood was slowly awakening from the muted slumber to a green song. This Sunday morning in early June, so far, was looking promising. Dad was at the altar, appeasing the gods with my favourite sandalwood incense sticks. Mom was in the kitchen, gently frying the grated coconut along with poppy seeds, cinnamon and coriander seeds. The plate of Kashmiri chillies along with the cloves and garlic attested that Chicken Xacuti was on the day’s menu. Now the thing with Xacuti is, you enjoy it best with a bowl of rice. However, in a mixed family, where the father was a Punjabi and the mother a Goan, there had to be a twist. So mom would transform ordinary rice into aromatic Basmati by simply adding the ‘Basmati Bay Leaf’ to it from her balcony garden. So much for budgeted secrets of middle class homes. Talking about our balcony garden, the sontakka (Butterfly Lily) flowers had blossomed to make an impression. Dressed in immaculate white petals, their sweet scent was intoxicatingly inviting. 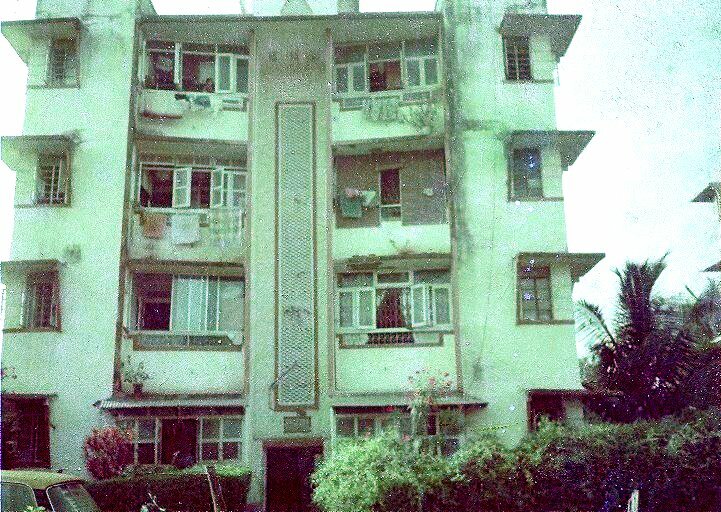 Two floors below, Aaji’s garden had her prized mogra (Arabian Jasmine) and rose bushes in full bloom. Mrs. Pereira’s garden, on the other hand, had the Raat Rani (Queen of the Night) slowly drooping into sweet dreams. Yes, this was nothing short of a floral menagerie, perhaps? My childhood home – 2nd floor on the left. Our next door neighbour, Mrs. Rangan was making her morning cuppa. Ah, the rich aromas of South Indian coffee decoction filtered through. Did you know that coffee beans can neutralize the sense of smell? Oh well, no wonder I could smell Mrs. Rampurkar’s puranpolis all the way up to the second floor. I think I also caught a whiff of Mr. Bansal’s fish koliwada. Sundays were special all over the neighbourhood, I guess. The smoke from the kerosene stove got me out of my reverie. We used it to heat water for our bath. I detested the smell and the chore. Nope, being Cinderella wasn’t my style. So mom did the next best thing to get rid of the sooty remains. She added a few drops of essence to a bowl of hot water. And voila, natural room freshener at your service. Vanilla and Rose were an all-time favourite. This would get replaced by eucalyptus oil as a natural remedy for nasal congestion for us kids. The rains brought with them damp walls and a musty odour. Add to that the problem of disease spreading insects, like flies and mosquitoes. The pungent odours of a few drops of vinegar mixed with a handful of rock salt in water would do the trick. Lizards were kept at bay with empty egg shells hung on walls. Simple but effective home remedies of yore. Lunch was a good 2 hours away. Dad was all set to head for his weekly building meeting. Dressed in his Sunday best, his white kurta pyjama, he dabbed on our family favourite. Picked from Crawford market, the imitation of the much coveted Poison perfume, then priced at a humble Rs 30/- He was all set to step out , when the doorbell rang. It kept ringing as he looked at me with expectant eyes to open the door. The ringing was getting louder and louder, when suddenly I was woken up from my slumber by my blaring alarm. I opened my eyes to the here and now, when just a minute back it had been yesterday, once more…………………. Written for the ‘Smelly to Smiley’ Contest by Ambipur in association with Indiblogger. What a beautiful neighborhood you had! The aromas of the delicacies you mentioned filled my memory as well. Oh yes, Saru. I was blessed to grow up in a neighbourhood where people knew each other way beyond just family names. I miss it so much…. Thanks Swapna, childhood memories are beautiful, aren’t they? Yup, middle class homes were such where food aromas and stories travelled to and fro. This post took me down memory lane too….Beautiful indeed. I remember visiting my neighbors place as a child only to see what was cooking on Sundays. It was a ritual with me. Though some adults would have got offended by my nosiness but my neighbors were sweet enough to share their dishes with me. No wonder, it all shows on my body, even now….Ha! ANyway, its a great treat, your posts, they always bring something beautiful to the mind. A nice Smiley post! Rainbow Hues recently posted…Letters Unsent : Please die! I was a lucky child to have a wonderful childhood. The colony remains, but the buildings have given way to redevelopment. Nothing is the same anymore. How I wish I could go back in time. Chalo ek aur tripplan karte hain! Nostalgia tinged with subtle fragrances, woven beautifully. Takes the reader along on a dream ride, back in time. I am glad it did Alka. I had quite a nostalgic time writing it too. Thanks for reading. This was such a lovely tribute to the wonderful nostalgia of the precious childhood! It must have been fascinating to grow up in such a cosmopolitan neighborhood! rajrupa12 recently posted…So What She was Raped? I Dont Care, Really! Oh yes, Rajrupa, I think I had a fab time growing up. It was a wholesome childhood and I am glad I had this neighbourhood to grow up in. I’d do it all over again, if I ever had the chance. Ritu Lalit recently posted…My Foot! Oh those darn kerosene stoves………….happy to let go of them. 😀 Yeah, this was nostalgia big time for me too! I could smell the flowers and the bay leaf simmering over the stove… beautifully written. You made me all nostalgic ! What an evocative post. You never cease to impress, Vinita. Ah, Shail……..it now feels like a dream, far, far away. But I am glad I could take you there. How nicely you managed to package all those lovely smells of your childhood into a dreamy post! What will you win as First Prize this time? Ah nostalgia, smells infused with memories. I have loved reading the posts in this contest. Aren’t we all little kids once again going back to our childhood through our noses! Beautifully penned! Rachna recently posted…Games words play! Lovely description of a typical neighbourhood, Vinita! Yes, it’s been a treat reading the posts for this contest! « Take My Breath Away!